1. The best mulch materials are wood chips, bark nuggets, composted leaves, or pine needles. Plastic, stone, sawdust, finely shredded bark, and grass clippings should be avoided. Do not use redwood or walnut mulch due to allelopathic effects. 2. Mulch should be applied from the dripline to the trunk (Figure 1). If this is not practical, minimum mulch circle radii should be 3 feet for small trees, 8 feet for medium trees, and 12 feet for large trees. Figure 1. Mulch should be applied from the trunk to the dripline. 3. 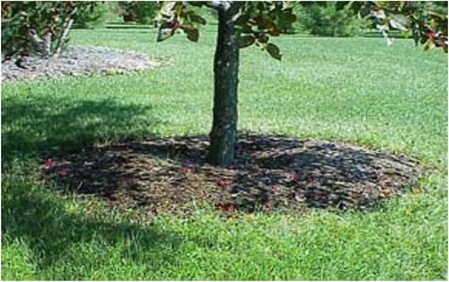 When applying mulch, it is not necessary to kill or remove existing ground cover. However, turf should be mowed very short and clippings removed prior to application. 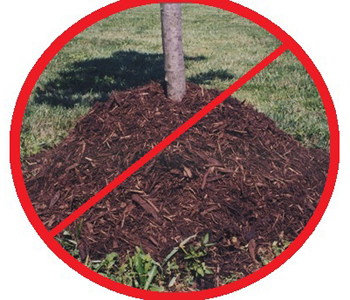 Mulch should be applied directly to the soil surface, do not use landscape fabric to separate the mulch from the soil. Mulch layer should be 2-4 inches thick depending on tree species and mulch (Figure 2). Figure 2. Mulch layer should be 2-4 inches thick and not be against the trunk. Just say no to volcano mulch! 5. 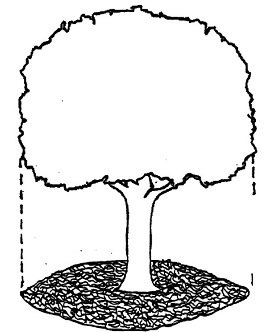 Mulch should not be placed against the trunk (Figure 2). Mulch will retain too much moisture against the trunk, potentially resulting in disease problems. Many homeowners choose to mulch because they enjoy the well-cared-for look it gives their landscape. But, they may not realize they are also providing many benefits for their trees. With mulch, the result can be a better growing environment for trees and their roots. Homeowners should be aware that, generally, the root system of a tree spreads out not down. The roots of most trees extend out a significant distance from the trunk. Most of the fine absorbing roots of trees are located within inches of the soil surface. These shallow roots are essential for taking up water and minerals for trees, and they require oxygen to survive. A thin layer of mulch, spread widely, can provide a healthier environment where these roots grow. Mulches are either organic or inorganic material mixtures that are placed over the soil surface around the base of a tree. Mixtures consisting of various types of stone, rock, pulverized rubber, and other materials are labeled as inorganic. Because these types of mixtures do not decompose, they need replenishing less often. However, this also means they do not improve soil structure, provide nutrients, or add organic materials to the soil. Inorganic mulches do still provide other benefits such as insulation, and protection. Organic mulches consist of wood chips, pine needles, bark, leaves, and other products derived from plants. These mulches decompose, thus are very beneficial in improving soil quality by replenishing nutrients. They do, however, require more maintenance because decomposition creates the need to replenish more often. In order for mulch to be beneficial, it must be applied correctly. All things in moderation should be a homeowner’s mulching motto. (Check out our Tree Owner's Manual for more information.) As beneficial as mulch is, too much can be harmful in more ways than one. Too much mulch can create excess moisture that may lead to root rot. Other problems created by over mulching include insect and disease problems, weed growth, sour smelling planting beds, and chewing rodents. Thin is better. Apply a 2 to 4-inch layer of mulch unless a drainage problem exists, then a thinner layer is recommended. Do not add mulch if there is already a sufficient layer. Instead, rake the old mulch to break up any matted layers and refresh the appearance. No volcano mulching. Avoid placing mulch against the tree trunks. If mulch is already piled against the stems or tree trunks, pull it back several inches so that the base of the trunk and the root crown are exposed. Mulch Wide. Mulch out to the tree's drip line or beyond if possible. Mulch should only be 2-3 inches deep around your tree. Keep the mulch 1-2 inches away from the trunk. And extend the mulch ring a minimum of 2-3 feet around the tree (the drip line is preferred).